That sounds like something from Project Voicebend. Good work. Izumi really should've went on the offensive. It's obvious that RC needs rebuilding, but not that Korra's going to be relevant in fixing it, which is absurd given that it's her show. Instead, she leaves to go on a completely out-of-character vacation with someone she doesn't even seem particularly interested in. The way to fix that isn't to make her more obviously in love. The way to fix it is to ditch the nonsense "love" scene altogether. My aim with the change was to make the ending better executed in what they wanted to happen and come across. To do that properly as a whole, they'd have needed to add more leadup, or tweak existing scenes to have more impact and be a bit more obvious. Hell, even just having Asami repeat or bring up her infamous(in a good way)"I want you to know that I'm here for you. If you ever want to talk, or anything," line would have helped. As far as Korra being relevant to rebuilding Republic City... Unless they did something like I did in my fic on a whim, adding "synthesis" of metallic and earthen based things using all four elements, I don't really see how Korra would be relevant to fixing Republic City's infrastructure. If anything, that would be Asami. Korra would still have a job to do, trying to make sure the whole Earth Empire transition is as smooth as possible, but unless they have Korra figuring out how to use all four elements to make earth and metal-based objects rapidly (like part of a skyscraper or apartment complex...) I don't see why she'd be relevant. Tenzin: You didn't ruin anything. You did what you thought was best for the World, and now things have changed. Change can be good or bad. Depending on your point of view. Korra: I know the people's point of view. It's bad. Tenzin: You're not the President, Korra. Your job isn't to fix the daily problems of every person in Republic City. Your responsibility is to bring balance to the entire world. And that means no matter what you do, some people are not going to be happy about it. Your sh*t getting ruined by a knock-down drag-out fight in your city, then a massive mecha exploding, and then a new Spirit Portal being formed in downtown isn't exactly a "daily problem", but given we haven't seen bending being used to help construct modern infrastructure, and there's no "synthesis", I don't see what Korra would be doing in Republic City. If anything she'd be in the Earth Kingdom. It still doesn't make her decision to go on a vacation any less selfish or off - I may not have specified it at first in my fic, but I intended their vacation to be 2-3 days in what I wrote, even if it ended up being all of 45 minutes(lol). The full month Mike has them gone from what I've heard is beyond excessive. Korra doesn't need to be involved in the physical rebuilding to be effective as a spiritual leader, though. Her role would be more to offer the people of the city some sort of hope for a better future than to make things better all on her lonesome. Not to mention, having her around is the only practical deterrent to former Earth Empire people starting something. Kuvira told her people to stand down because they didn't stand a chance against the Avatar. A missing Avatar would obviously make it more tempting for an ambitious former general to start something. Asami: *stopping in the crater* Wait. What do you mean? What's the Earth Empire got to do with anything? I was just... thinking out loud. I want to see the Spirit World, and you said it "sounded perfect". Korra: *laughs weakly* There was a reason I didn't mention her... but if you want to go to the Spirit World, and I... I'm looking for someone to help you, maybe both of us. *eyes light up again* I know just who we can talk to! Korra: Zuko's uncle, Iroh! *pause, grasping Asami's hand* If I remember right... he dealt with a very personal loss. Korra: *nods* And he was around after the Hundred Year's War... Maybe he can help me out too. *Asami gives her a slightly annoyed glare* Asami: I know what else the crater reminded me of - rebuilding, and all the work Future Indus - *visibly annoyed and slightly angry* rats! So much talk about business. I thought this was supposed to be a vacation. And what was that about "short" earlier? Korra: *a little taken back* Oh, don't worry - Iroh is really friendly. Don't worry about feeling stressed while we talk - the first time I met him was during Harmonic Convergence, and we both know how fun that time was. But he still made me feel welcomed and warm. *smiles* And a few minutes with him feels like a long time - in a good way. I'll tell you more on the way in. *Korra now approaching Portal again, tugging on Asami's hand* Korra: With him helping guide us, I think even two or three "out here" days will be enough. And I'll have all my bending, so we'll be safe. Come on. *Asami nods, coming with her* Anyways - Iroh said time feels different in there. 'Course, he's a spirit now, so... maybe that's part of it. Asami: Such a big crater... *looks towards the Colossus' remains, looks back at Korra after mumbling "Father..."* Uh. What are we doing first? Or after, for that matter? Korra: *distraught* I wish I knew what to say. Wherever Iroh takes us, whatever spirits he takes us to meet, they'll help. *looks directly at portal, then Asami, blushing slightly* A very kind, and pret- *blushing more*... uh, smart person once told me she'd be there for me. *no longer blushing, hugging Asami* I also remember she told me to enjoy one day during a very rough time, for someone else - so let's try and enjoy this. But not for Jinora - for each other. *Asami now blushing slightly* Asami: All this time later. You... you remembered what I said. Korra: *smiles* Yes. I don't think I know enough to do much more than give you a hug, but it's better than nothing. *smiles broader* Let's call this our "or anything". Asami laughs: Sure - for now. *Korra gives her a curious look, Asami smiling mischievously* And no, I'm not explaining. *serious again* I feel a lot better... but I still want to talk to Iroh. About everything that's happened... *tugging on Korra* Let's go. Korra: Now that sounds perfect. I do like the idea of addressing Asami's grief -- highlighting that could even provide some emotional logic to the obviously impractical vacation -- but it works better the more it avoids the romance angle, because the romance angle is inherently distracting. Korra: (To Asami) Want to sit with me for a minute? I'm not ready to get back to the party just yet. Korra: I don't think I ever really apologized. Asami: (Looks to Korra curiously) For what? Korra: (Switch to a left profile shot of Korra as she turns to her friend guiltily) For what happened to your father. Asami: Korra, that's not your fault. Korra: (Looks down) Actually... it kind of was. It might have been his plan, but I was the one giving the orders. Asami: I can't blame you for that. And, honestly, as much as I wish things turned out differently... I'm just glad I was able to forgive him. Korra: So what now? Back to the dance floor? Asami: (Looks at her feet) I'm kind of all danced out. Honestly, after everything that's happened the past few months, I could use a vacation. Korra: Believe me, I'm not so sure that will help. Asami: (Frowns) So what do you suggest, then? Korra: Did I ever tell you about that time I met Zuko's uncle Iroh in the Spirit World? If there's anyone who can help, he can. Asami: (Cut to a close up of Asami as she looks surprised) Really? (Glances down in thought) Okay. (Looks up at Korra) I've always wanted to see what the Spirit World's like. (Camera slowly pans up to the spirit beam in the sky. Scene fades to an overhead shot of the Republic City portal as both friends walk towards it. Camera changes angles to focus on an eel-spirit floating around the portal. The camera slowly pans down to reveal Korra and Asami in their usual outfits and they each sport a camping knapsack. Various spirits gather around the portal as they continue to walk. Switch to profile shots of the girls as they look a little uncertain. Korra then turns to her friend with a smile and Asami looks back to Korra with a smile of her own. I really like this. Even if it was just a short scene, even shorter than what we got for Zuko’s family life, this would have been really good in the actual show, for both Asami, and the two bending brothers. Maybe even Kuvira as well, her abandonment. Instead of four seasons of showing and telling, we got more telling than showing… Oh well. Tarrlok and Noatak got plot/character flashbacks. Korra saw the Yakone flashbacks. Tonraq and to an extent Unalaq got plot/character flashbacks. After Season 2, they sort of vanished, Old Wounds with Lin and Su, Korra Alone and some more background on Kuvira's break with Su etc notwithstanding. Some kind of flashbacks, even as short as the ones Zuko had of him and his mother, would have helped add weight. This, on the other hand, I agree about completely. Asami desperately needed a flashback and never really got one. The original was posted four years ago, likely right after TLOK came out, so there's no super long time to stew and then post involved here. Oh, oww, that really hits home hard. o_o I could definitely see something like that adding sympathy for the Ferret Bros.
Korra comes back and the URN is conquered, and Kuvira has been freed and is ruling over the Earth Empire. Oh God no. If they name it that, I guess that's another comic series I won't be following at all. It was only the New Ozai society because Mai's Dad's city was named New Ozai. So it would be the St Kuvirasburg Society. Asami is the "Saint" so it would still need some tweaking. Perhaps Frau Kuvira's Anschauung? Kuvira: "I swear I told them I didn't want this." Korra: "You're wearing a crown." Korra: "You're holding a scepter." Kuvira: "It, too, is stuck." A blood vessel just ruptured. It was throbbing before but now it is gushing. I don't like blood. It's thick and red and irritating and it gets everywhere. And if Kuvira was put at the head of it, it could still go by The Earth Empire. It would be foolish to abandon a concept with such high approval ratings, at least inside the former Earth Kingdom. At the least, it would carry a cache of legitimacy. I mean, it would have been only days or weeks since Kuvira's defeat at RC. They could treat it as a blip. An unjust imprisonment, rightly ended by brave soldiers of the Earth Empire. Just a quick nod to this brilliant line. I see what you're doing there. Remember back during Book 2, when the Cloudbabies ran into a familiar face while in the Fog of Lost Souls? What if Zhao had followed the Kataang siblings out of the fog and back into the mortal world? Just picture it, while Korra and Unavatuu are battling, Zhao could've been in the background, either reenacting his scenes from Siege of the North with Tenzin, trying to challenge Mako to an Agni Kai or just screaming at the moon in the nightsky about how he was going to slay the spirit once and for all. At the end of the finale, Tenzin, sick and tired of dealing with the Commander's rantings, but also feeling that he can't just send the man back to the Spirit World either, leaves Zhao in the South Pole with healers, hoping that they could do something for The Moonslayer. 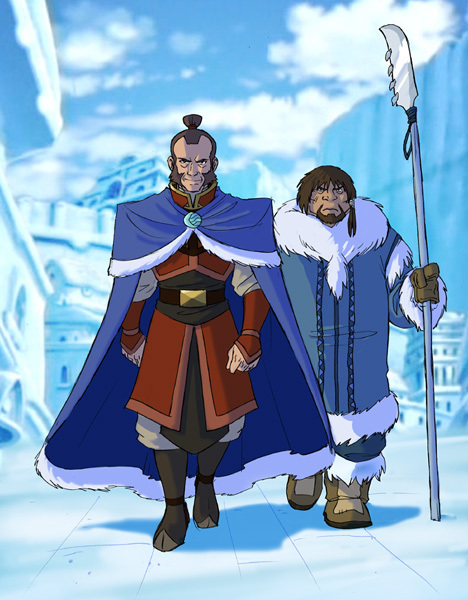 Then after the three year time-skip, as Korra is leaving the South Pole for her solo journey, she passes a group of hunters on the docks, one of which is the former Commander Zhao, now wearing a Water Tribe parka and returning home from a fishing trip. I'd be down with pretending the ATLA comics and TLOK were the fanfiction and the Water Tribe web comic was the actual canon. So far, I don't think the comics have contradicted Water Tribe. But yes, I agree. I have my Water Tribe hard copies on my "display" bookshelves. My Dark Horse Avatar comics are stacked up behind a door that itself is behind two big stack of books I need to find shelving space for. If anything, I think events from the comics have helped support Water Tribe as canon (so far anyway), you got Azula's disappearing acts, spirits getting involved in the lives of humans, heck, Ursa's fate in the Search even shares a few similarities with Zhao. Now with this in mind the small line I would add would be at the beginning of the LoK episodes. All characters appearing in this work are fictitious. Any resemblance to characters, whether they are original ones emerging out of or carried on from Avatar: the Last Airbender, living or dead, is purely coincidental. Now to reread Water Tribe.